Chronic stress is one of the most insidious health conditions in modern society and is linked to increased risks of developing and exacerbating nearly every chronic disease- including cancer. Researchers have found that chronic stress may promote cancer growth, metastases (spread) and recurrence by causing physiologic changes that make your body more conducive to cancer growth. And if all this isn’t bad enough, study after study report that cancer patients and survivors who experience chronic stress have higher levels of pain, fatigue, anxiety, depression, sleeping difficulties, and many other symptoms that negatively impact on quality of life. One of the best ways to significantly reduce the production of the “stress hormone” (cortisol) is to meditate. Meditation can 1) help reverse MANY of the physiological effects that make the body more conducive to cancer and 2) improve your quality of life. The science has proven these benefits which is why I encourage all patients enrolled in the IOE Premium Program to incorporate 30 minutes of meditation time into their day. The IOE Premium Program is available free to all patients of 21st Century Oncology and through consultation by phone, video teleconference or in person for everyone else. Although there are a ton of options that you can use to help manage stress (such as counseling, support groups, exercise, massage, acupuncture, guided imagery, yoga, etc. ), my favorite is meditation because it is scientifically proven to be effective and requires little more than you and a comfortable, quiet space. If the thought of meditation conjures up images of bearded yogis seated cross-legged on a mountain top, eyes closed and repeating a mantra (like ‘om’) you are not alone. In fact, the majority of my patients have never meditated before. When I prescribe a meditation program (instead of a pill) many of them look at me as if I just told them to do the craziest thing they’ve ever heard. Of course this reaction is total understandable, after all who thinks they are going get a prescription for daily meditation from their doctor? So how do I get my patients to start meditating and stick with it when there are so many techniques out there, many of which involve seemingly awkward body positions, unnatural breathing techniques and odd sounding mantras? To make matters even more challenging, who has the time (or the patience) to invest years of practice required to master the art of meditation? A couple of years ago, I was searching for the most effective and simplest meditation technique out there. I spent a great deal of time researching and reading about numerous techniques and I gave a bunch of them of try until I finally found what I believe is the holy grail. Millions of people around the world use this technique to effortlessly and much more quickly (compared with traditional meditation techniques) reach states of deep meditation­. Ever since I found out about this technique I have been using it and I now recommend it to all of my IOE Premium Program patients. You simply relax in a quiet, comfortable place, put on headphones, press play on your MP3 audio player and listen to the specialized audio soundtrack embedded with BWE technology. After only a few minutes the technology will begin to take effect as it causes your brainwaves to synchronize (“entrain”) with the frequencies in the audio track. I know that this sounds a bit hokey (it sure did to me when I first read about BWE), but the science is legitimate. The most common type of BWE uses a technology called binaural beats which works by sending a different sound frequency to each of your ears through headphones. The difference between these two frequencies matches the frequency of the brain state we want to entrain the brain to. For example, if the left ear is sent a tone with a frequency of 200 Hz, and the right ear is sent a tone with a frequency of 205 Hz, the brain hears the two tones together as a pulsating beat (a binaural beat), which is essentially the difference between the two tones (5 Hz). The brain then follows the frequency, producing brainwaves at the same level. The technical term for this process is ‘frequency following response’. Binaural beats recreate brain (wave) states, and are able to bring about states such as meditation, heightened creativity, increased focus and concentration, reduced anxiety, sleepiness and general relaxation. The process happens by itself, inside the brain. The only requirements are for the recordings to be engineered properly, and for the listener to put on a pair on headphones, relax and press play. It’s that easy. Isochronic tones are the most powerful type of BWE, utilizing equal intensity tones, increasing the pulse speed, and synchronizing your brain with the rhythm. Isochronics use a distinct and clean wave form which is designed to harmonize with the brain much more efficiently. As with binaural beats headphones are needed to get the most effective results. The effect on the listener’s state depends on the brainwave state the recording is engineered to target. For example, to induce deep relaxation a 4-8 Hz Theta brainwave recording is used. For entraining the brain to sleep better a 1-4 Hz Delta brainwave recording is used, and to improve memory a 14-40 Hz Beta brainwave recording is used. Delta (1 – 4 Hz): Deep sleep / bodily regeneration of cells. Theta (4 – 8 Hz): Dream state / deep meditation/ relaxation / high-level creativity. 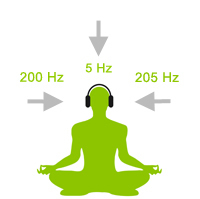 Alpha (8 – 14 Hz): Relaxation / deep focus and concentration. Beta (14 – 40 Hz): Awake / alert / engrossed in a mind gripping activity. Gamma (40 Hz +):High mental activity / high-level information processing. Although it only takes about 7 minutes for the brain to start synchronizing with the audio, you will want to give yourself 15-30 minutes of listening time to experience the effects of BWE. Get in a comfortable position. You can either keep your eyes open or closed. Many beginners find that keeping their eyes-closed is usually easier so there are less distractions. Place your headphones on, press play, then focus on the music and your breathing. When you notice your mind wandering to a stressful thought simply bring it back to the concentration on listening to the music and on your breathing. As you practice you will be able to more quickly calm and still your mind. BWE makes this process much faster than with traditional meditation techniques alone. In my opinion, the Brain Evolution System is the BEST BWE product I have used. It is very powerful and quickly puts you into the most relaxed and deepest state of brainwave synchronization. If you want to meditate deeply and get ALL the benefits of BWE, this is the program for you. Many of the other BWE products only use binaural beats, however the Brain Evolution System uses “3-Point Dynamic Entrainment Audio Process” technology. This is sort of a hybrid of binaural beats and isochronic tones which is designed to enable you to experience deeper relaxation, better visualizations, improved focus and peace of mind. Unlike the other BWE products in this list, this is a full 6 month course spread over 6 CDs / MP3 downloads. Here’s how it works: Listen to one CD for a month, for around 30 minutes per day, 3-6 times per week. After 30 days you switch to the next disk on the intensity scale – and incrementally improve your ability to reach (and stay in) peak performance states – flow, inner quiet, sense of connectedness – and benefit from all the health benefits of brain wave entrainment – less anxiety, more happiness, more creativity, better moods etc. If you’re looking to get the absolute best results possible, then Brain Evolution System is for you. The Brain Evolution System is the product I recommend for the patients in the IOE Premium Program. Listen to the Free 15 minute Download. Holosync is the most famous of all the BWE programs. If you have ever heard of binaural beat technology then you likely learned about it from these guys (like I did). It uses a scientifically-proven audio technology which they call Holosync®, that will easily and effortlessly place you in the BWE patterns of deep meditation. This is an extremely high-quality audio product. Holosync was one of the first BWE technology producers to hit the market (created in 1989), and has since grown into the most highly recognized BWE product company in the world. Although this is the most expensive of the BWE programs it is also one of the best. Listen to the Free 30 minute trial CD. My next favorite BWE product is OmHarmonics by MindValley. OmHarmonics uses a next-generation binaural beats meditation audio technology that is augmented with heartbeat synchronization and ambient sound technology that quickly and effortlessly allows you to enter and stay in the Alpha level (8 – 14 Hz: Relaxation / deep focus and concentration). Although this BWE product will not get you into the same deep relaxation states as the previously mentioned products, it’s great as a background sound when you want to relax but not necessarily meditate. They have 15 and 30 minute soundtracks that you can play depending on how much time you have. If you are looking for the least expensive option to give BWE a try I recommend The Unexplainable Store. Although the soundtracks are not nearly as high quality (or as effective) as the above products, they are definitely worth trying out to see if they will do the trick for you. Many folks start off with soundtracks from The Unexplainable Store and graduate up to higher quality products later on. They have a nice summary of the BWE technologies on their site here. Meditation is one of the most effective ways to reduce the cancer promoting effects of stress on your body. As one of the key components of the IOE Premium Program all patients should try to incorporate 30 minutes of mediation into their day to help anticancerize their body. Although there are many meditation techniques out there my favorite is using the scientifically proven brainwave entrainment (BWE) products to supercharge your meditation experience.